In vivo conservation encompasses a range of actions that can be taken to ensure the survival of livestock breeds or populations that are threatened with extinction. 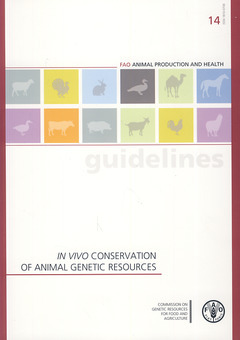 These guidelines address both “in situ” conservation (supporting the continued use of threatened breeds in the livestock production systems where they have traditionally been raised) and “ex situ” conservation (maintenance of populations at sites such as conservation farms and zoos). As well as providing a wealth of information on breeding strategies for small at-risk populations, the guidelines provide advice on how to develop an effective and well-targeted national conservation strategy.